The 2017 Most Awesome Contest has been another year of touching moments and great successes through recognizing the outstanding Managers and Board Members of our Central Florida Community and beyond. We hope that everyone will continue to nominate your "Awesome" Board Members and Managers. 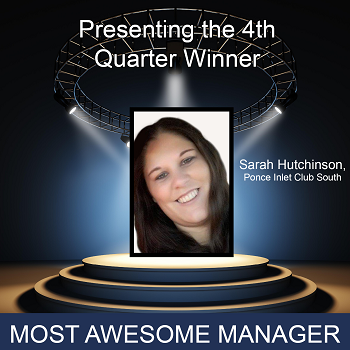 Clayton & McCulloh is proud to present the Most Awesome Manager Award to Sarah Hutchinson, Manager at Ponce Inlet Club South. Congratulations, Sarah! 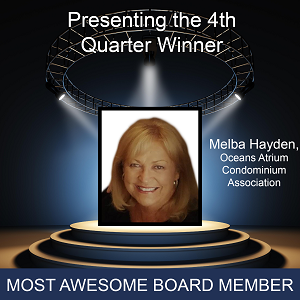 Melba was nominated by the Manager of Oceans Atrium Condominium, Marisa Rains. Marisa nominated Melba saying: “Melba is the most compassionate board member and owner. She will go above and beyond to help others in the community. She puts others before herself in all that she does. Melba has served as President for seven years and is loved by all.” With an endorsement like that, it is no surprise we selected Melba as our Most Awesome Board Member for the 4th quarter of 2017. Clayton & McCulloh is proud to present the Most Awesome Board Member Award to Melba Hayden, President at Oceans Atrium Condominium Association. Congratulations, Melba!